Yep cooking is a challenge for a person like me. I married on Feb 14 2003, learnt how to make coffee and sambar, rasam from my hubby. Oops, as there is a saying "Practice makes woman/man perfect", it took atleast an year for me to make a good sambar/rasam. 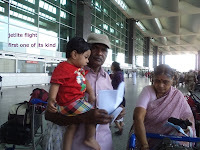 My father-in-law was working for defence when we married and my mom-in-law stayed with my father-in-law. They were in Noida. Once I was 8th month pregnant carrying Aditya, my mom-in-law came down and started staying with us. From that time, till last year she was making delicious food, I used to help her only by chopping the vegetables. On Saturdays, if I cook by any chance, it used to be a disaster. But after starting blogging seriously I learnt so many new things which included to set the measurements right. For example, making Rasam is very easy only few ingredients - salt, rasam powder, tomato, water, jaggery and any additional things to add flavour - curry leaves, cilantro. It can be cooked with or without dhal. But if the measurements are not correct, then it would be tragic situation at home. For different rasams please click here. Belated Ugadi festivals wishes to all my blog readers. I know, might be you are thinking why I am wishing in this post. Coming straight to the answer, Ugadi is also considered as New Year for Andhrites or Telugu people and also for Kannadigas and a start for all new things. Ok, so what? I have started cooking from this Ugadi in my house and today, it is 6th day of my successful food at my home. Successful???? My hubby who loves to have tasty food, said you are preparing good dishes. Wow, that helps me put a new cap of Chef in my house, which I lacked almost for 9 years after my marriage. Hats off to these spinsters and lovely moms. These are just a few to name. There are many please visit here to see whom I follow. So, here is just a list of what I made, the recipes will come out soon. Sweet was: Akkibelepayasa. As this has to be done for Nivedhyam, it was done by my mom. Side Dishes: Papads and Aamvada (aamvada was prepared by my hubby, as I had to catch my little son Aadya). Hit thing was cooking we started at 12pm and 1:30pm it was ready. Usually, we used to take our meals only by 3pm on festival day. 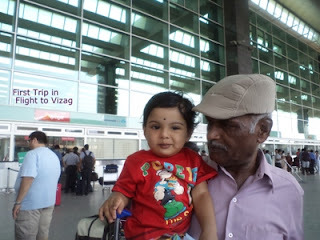 Reason for me entering kitchen was: My MIL, FIL and Aadya, little one was going to Vizag the next day, i.e., on 24th March 2012 so in-laws were busy packing their luggage for a fortnight. My hubby only informed them to pack and asked me to cook food. I was happy to get an opportunity and more happier when it came out with great tastes. 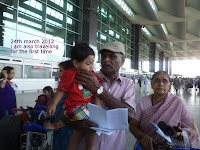 Day 2 - 24th March 2012: First Voyage of my inlaws and little one in flight. Lunch menu was perfectly fine and was ready by the time Aditya arrived from his school. 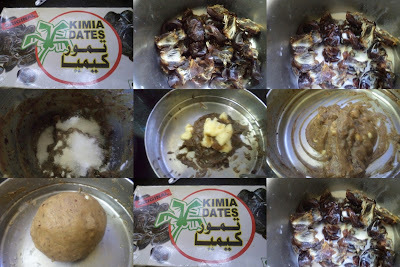 Evening Snacks(planned): Eggless Dates Cake which turned out to be bad because i added more maida and made it thick mass. Potato Cheese Balls: Potato palya was ready and I had brought Cheese from store. But I did not check the oil, which had got over. So evening snacks did not go well. Hence, I learnt the lesson once again, planning is essential.